In American public schools Henry Ford gets credited with inventing the assembly line. He’s touted as an American hero for figuring out that dividing labor into small specialized tasks could maximize output and drive down production cost. If you believe this story, you are complicit with the oversimplification of American history. By his own words, Henry Ford cites the meat packing industry in his autobiography My Life and Work for giving him inspiration to work with an assembly line. 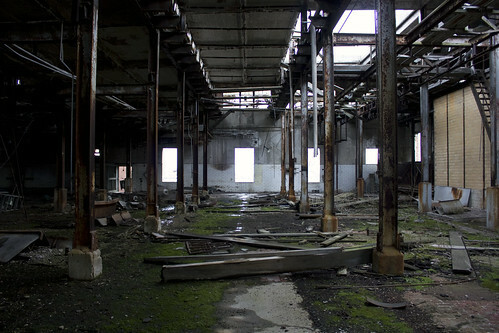 Photo: On the main floor of the plant. The truth of the matter is that the meat packing industry beat Ford to the assembly line punch. Philip Danforth Armour had every bit of meat processing down to a science. Armour’s competitive edge over other meat packers was to use ever bit of the animal “except the squeal.” The Armour product catalog included not just meat, but also adhesives, fertilizer, drugs, industrial chemicals and even Dial soap. When Armour and Company were founded in 1867, refrigerators did not exist. Meat had to be processed by a local butcher, sold, and consumed in a relatively short amount of time. One of the largest costs associated with meat packing was shipping the animal live via rail to the location it would be slaughtered. The rail lines of the time made massive profits shipping cattle as railways expanded westward towards California. Armour saw an opportunity in this vastly inefficient system. Adapting one of his chief competitor’s ideas to refrigerate meat, Armour built their own fleet of refrigerated boxcars to ship processed meat all across the country. 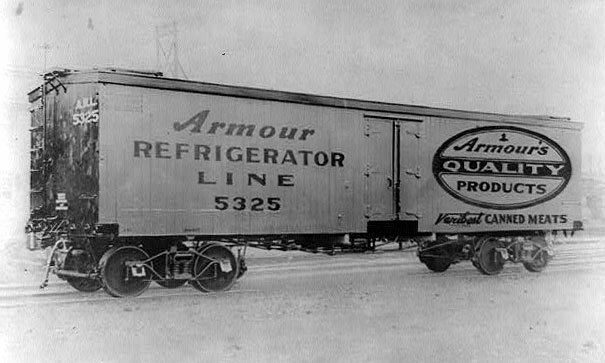 Armour had 12,000 refrigerated boxcars in operation at its peak. This innovation had a cascade of benefits for the consumer. Not only could meat be purchased cheaper, but could also be kept fresh for longer periods. Other food companies quickly adopted refrigeration and raised food quality standards nationwide. Photo: One of the massive refrigeration generators still at the Armour plant. 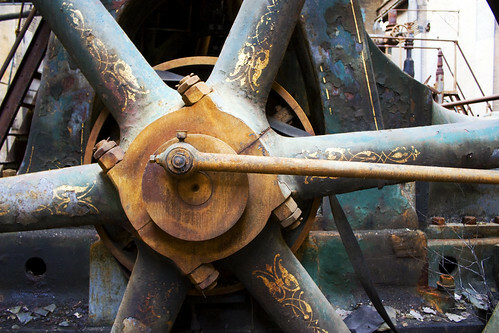 Photo: Wheel on one of the refrigerator generators. Notice the intricate lattice work painted on. How many heavy industrial machines still have that personalized level of detail? 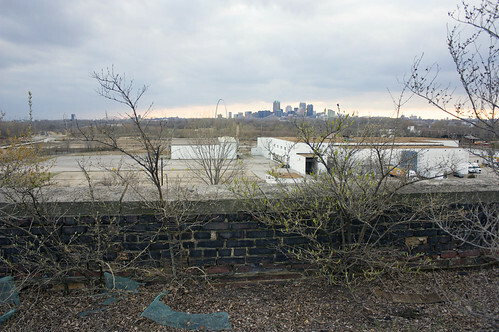 The Armour Packing Plant is a massive industrial complex surrounded by dense vegetation just to the north of East St. Louis, Illinois in what is known as National City. Getting into the location is fairly easy, though you MUST bring a partner with you. There are many holes and rickety steel platforms on the first floor that can lead to a nasty fall. Getting up to the higher floors is a bit tricky. The main stairwell for one side of the plant is missing the first few steps and has a nice twenty foot drop to the basement. Again, bring a partner. If it wasn’t for my urbex safety buddy I would have never been talked into actually making the climb. Photo: Slaughtering room lined by tile. Moss now grows over most of the floor. There are rail lines on each side of the factory. On the back side is a complex to remove cattle from boxcars as they arrived. The cattle were moved to the slaughtering room on the top floor pictured above. From this point the carcasses were stripped of flesh, cut into pieces, and sent to specialized rooms. There is an intricate series of doors, tubes, and other means of transport to move the product throughout the factory. Everything eventually made its way to the first floor, where it was packed into boxcars on the opposite side of the factory. Photo: The Gateway Arch in St. Louis across the Mississippi River. Photo taken from the roof. The building immediately across the street is owned by Little Ceaser’s Pizza. Armour and Company began production at this site in 1903 and it stayed open until 1959. The company languished after World War II and its assets were eventually sold off. Dial soap, perhaps Armour’s most lucrative product, is still in production to this day by another company. 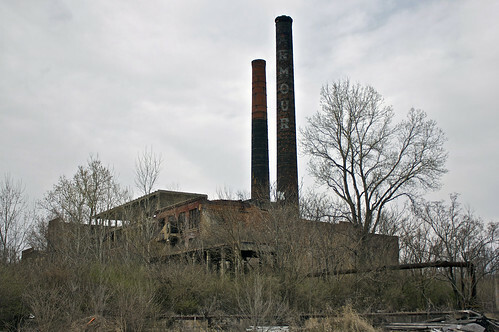 Armour eventually donated this factory to the city of St. Louis, where it sits unattended to this day. 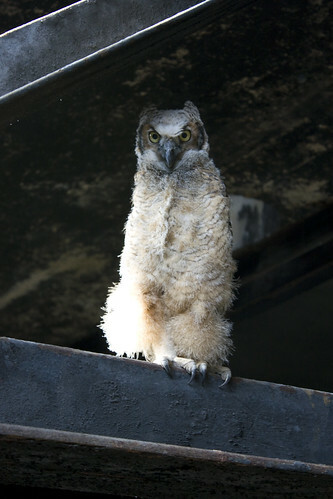 Photo: A young owl standing only a few feet away. It was about 18″ tall and the talons were intimidating. Exploring the abandoned Armour Meat Packing Plant was quite satisfying. My friend Drew and I found something new around every turn. There were also plenty of clues in each room to make an educated guess about what that specific area was used for. In the course of exploring the factory we came across two owls. The first one was much larger than the one pictured above. It swooped down and held its wings out while clicking its beak. Unfortunately, I didn’t manage to get close enough to snap a decent photo of it. 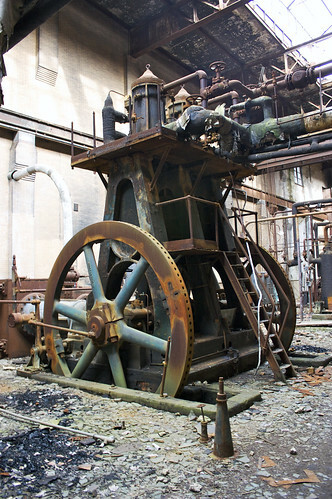 Later we made our way up a large steel staircase to the uppermost part of the factory. Drew told me to freeze and turn around very slowly. When I turned, I said that I couldn’t see anything, and then it was there. We were only a few feet from a large young owl. My partner descended the stairs slowly, but I stayed behind, slowly raised my camera and started snapping photos. My heart was absolutely pounding at this point. Urbex gives me a rush every time I stumble upon a new location. I want to see everything it has offer and photograph it. 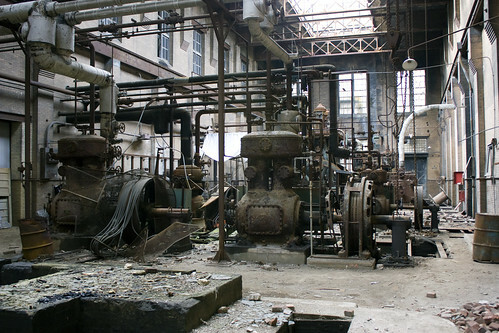 But, there is a level of adrenaline that you become acclimated to when you do urbex enough. Running into the owls was a high unlike any other. It was unnexpected. It was natural. It was dangerous. It was the highlight of the day. I have been exploring the site for the last few years and something sinister has been going on lately. Some doorways are crudely blocked off, there’s a good deal of litter, and it looks like someone is scrapping metal. Exploring the site over a period of years is interesting because you see how the decay progresses. I was wondering who the author of this article is? Check your email. I sent you the information. I wonder if this place can still be accessed… any info ? The article is about all I’m willing to divulge. I encourage you to do a bit of research. Be safe and have fun. Very trippy complex! I was all over it today and climbled the smokestack form the inside of a building to the roof. Once on the roof I thought about climbing to the top, but since it was raining and I was by myself with no equipment, I ended up not trying it. … and can’t find a corresponding image in any of those links you’ve got. It’s killing me not knowing where this thing was filmed! Palm trees do not grow in East St. Louis. One other thing: that shot says Albuquerque but I find zero references to such a place on Google. Frustrating stuff! Wow, that’s a really good point– guess I’m at another wall here. I’ve been trying to find this place for a while now. ive been exploring this site for years. everytime i go back the hole in the roof is even bigger. last time I was there I really did not feel safe on the roof. I have not been to this site for a couple of years though. I’m wondering if it will be around for much longer due to the new freeway construction nearby? Any tips for going to the place? ie, places to park, places to avoid in the plant or around? Philip Danforth Armour is my great, great, great grandfather. Thanks for sharing these pics! Excited to explore the plant next time I’m in the St. Louis area! I just discovered a picture in the late 1800s (I think) taken in Ironwood Michigan of 8 men . Four dressed in dress clothes and top hats .Two on each side with butchers aprons and meat cutting knives. In between them steers long horns with a leather cover (fancy) with Armour & Co printed on it. It looks like the pictures of the four (not the butchers) were the owners. I think there was an Armour Star in Winston-Salem,NC, in the 50’s. My dad was supposed to take over the management in the late 50’s but something happened to stop that. Would you have any info on the plant in Winston-Salem so I could possibly figure out what went wrong?